There are two main types of stocktakes. A rolling stocktake means counting a small number of items at a time, ensuring that your overall stock is counted on a consistent basis. You may select different locations, stock groups, types, suppliers, etc to stocktake a various times. All items are counted at one time. Traditionally, during a full stocktake, the store is closed, and no transactions may take place until the exercise is completed. The inconvenience caused by closure of the store varies from minor to significant. The benefit of using mSupply's stocktake module, while requiring that the store is closed while the physical stock check is in progress, is that the store may be opened immediately after the physical count is completed. Entry of the adjusted figures into mSupply® may be made at any convenient time over the next few days. mSupply will not allow stock that is on a Customer Invoice with status = “sg” to be taken out of stock by any other transaction process, including an inventory adjustment flowing from a stocktake - refer Creating inventory adjustments. A stocktake makes a list of your stock, providing you with a 'snapshot' of your stock at a point in time. mSupply® enables you to automatically create custom printed lists of your stock items from which you and your staff can do the physical stocktake. The items included can be customised to focus on particular location(s), particular items, or your entire store. As of version 3.1 mSupply also has a web stocktake module, that allows entering stocktake results from a laptop or tablet on the warehouse floor. All: shows all stocktakes in the current store with any status for all time. Could be many of them! Current: selected by default when the window is displayed and shows all stocktakes with a status of Suggested (sg). This year: shows all stocktakes of any status that have been created in the current year. Last year: shows all stocktakes of any status that were created in the year before the current one. There is little point in keeping old stocktakes with status = “sg”, especially if you are about to create a new stocktake containing the same items. If time has passed since the stocktake was created, then the snapshot and actual quantities are almost certainly incorrect. For good housekeeping reasons, it is good to delete old “suggested” stocktakes (status = “sg”). Search for items by Donor (e.g.items that have been donated by an organisation) NB. this filter needs to be set in Preferences:Invoice Preferences. Search for items by some criteria (item name, code, category). Search by actual shelf location. Search for items whose expiry is before a particular date. This allows you to easily remove all expired items from stock. Select a number of items randomly chosen by mSupply. Note that the “Shelf location” in the top left drop-down list is the default shelf location of the item, which is where the item is usually stored. To search by actual shelf location- where the stock has actually been stored- use the “Actual shelf location” panel. The stocktake list shown below, with items listed in alphabetical order is the result. Description: A default description is filled in for you. You might want to edit it to make it more memorable. For example, add “Annual stocktake” or “Monthly check” so that you can easily see what the stocktake was for when you look back at your records later. Comment: Put any other information you need to record about the stocktake in here. Stock take date: This is the date you performed the stocktake and is set to the date the stocktake was created by default. Users will only be able to edit this if they have the Can edit stocktake dates permission set (see Managing users for more information). They will also be able to set the confirmation date of the inventory adjustments created from the stocktake when it has been finalised (but you can never change the date to before the Stock take date set in this field). Stock take key: The stock take number. This is an automatically generated number which increments by 1 for each new stocktake. It is unique within a store only so it is possible for stocktakes from different stores to have the same number. Stock take entered date: The date the stocktake was created in mSupply. sg = suggested, the stocktake is still being worked on and is editable - new lines can be added or deleted and values can be edited etc. If you want another sort order, click a column heading for a simple sort, or choose the Custom sort option from the Order by button. Stock take line with space - is the same as the one above but with no quantity and 5 lines of space under each line. Useful if you know there's a lot of stock in the warehouse that isn't in mSupply. Stock take line wt quantity - is the same as Stock take line but with no quantity. This is the one we recommend you normally use to give to the people carrying out the physical count. This helps to ensure that the quantity of stock on the shelves is actually counted and not just guessed! Stock take lines with signature - same as Stock take line wt quantity but the stocktake signature entered in the printing preferences is printed at the end. Stock variance - this shows the items that were adjusted after the stocktake was finalised. Similar to the Inventory adjustments option below but a slightly different format. Inventory adjustments: prints information about all the items that had their quantities adjusted because of the stocktake after the stocktake has been finalised (see finalise section below). Inventory adjustments-all items: prints information about inventory adjustments made after finalisation but includes all items, not just those which have had their quantities adjusted. Allocate staff to perform the stocktake, instruct them in the process you wish to follow, and issue the sheets to them. Once the physical stocktake has been completed, you are ready to make entries to record any differences in stock levels into the system. Remember that any item which mSupply calculates as having zero stock will not appear on the stocktake sheet. To help quickly find any item you want to make any adjustments to, you can enter the first few characters of its name or its code in the Search by item name and code field. The displayed list of items will be changed each time you enter a character to show only the items whose name or code matches what you have entered so far. To return to the full list just delete everything in this field. Double click on the row you wish to edit, and the Edit stock take line window appears, with the figure in the Stock take quantity field highlighted. Enter the figure from the completed stock sheet in the Stock take qty field (just type the new figure, and the currently highlighted figure will be replaced). change the batch, expiry date or location fields also if needed. Tip to make things fast! 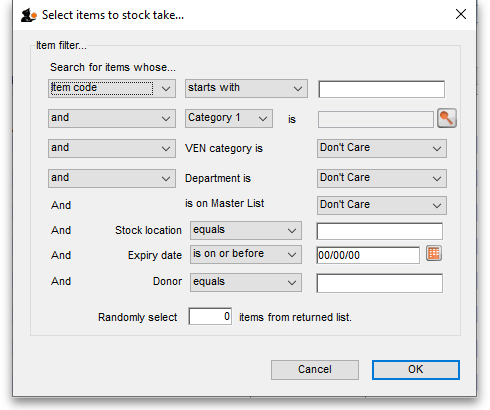 : If you only need to change the quantity for a particular stocktake line then click on the value in the Enter quantity column and type the correct value directly into the stocktake sheet. Use the Tab key on the keyboard to move to the cell below that one or shift+Tab to move to the cell above it. If you want to add a line of stock that already exists in mSupply then, in the Existing stock lines table at the top, check the checkbox for the line you want to add and then click on the Add selected button. You can add more than one line if you wish - just check all the lines you want to add. If you check the checkbox in the header of the checkbox column this will check all the boxes for you (and uncheck them again if you uncheck it). If you want to add a new line of stock that doesn't exist in mSupply then enter its details in the New stock line section at the bottom and click on the Add new button to add it. Stock take qty: the number of packs you found in the warehouse. Pack size: the number of items in each pack that you found in the warehouse. Batch: the batch number of the item you found. Expiry date: the expiry date of the item you found (click on the calendar icon to select it or enter it manually). Location: the shelf location in the warehouse where you found the item (if you don't know the exact location then type the first few characters of the location label, press the Tab key on the keyboard and select the location from the list that appears). Cost price: if you know it, enter it in the currency you are using in your datafile. If you don't know it, you could check the 12 month average checkbox and mSupply will enter a weighted average price of all the stock of this item you received over the last 12 months. Sell price: if you know it, enter it in the currency you are using in your datafile. Use details of line selected above button: this is a shortcut to save typing values in all the fields in this section. If the details are similar to a stock line that is shown in the Existing stock lines table above then click on the line in the table to select it then click on this button. mSupply will copy the details of thew line into the fields in this section and you can then edit the ones that aren't quite right. You can also select a colour for the line in the stock take using the colour picker in the top right hand corner (set to black by default, as shown in the screenshot). After clicking on either the Add checked or Add new button you are returned to the Stocktake sheet window, where the new line entered will now appear in the colour selected; note that the new line(s) appear at the bottom of the stocktake and they have a value of zero in the Snapshot column. All details of a new line added may be edited, but only the quantity or the location of existing lines on the sheet may be edited; this is performed by double clicking on the row you wish to edit. The Delete item button will only work to delete lines which you have added yourself (i.e. lines with a snapshot quantity of zero). Creating inventory adjustments (finalising the stocktake) is not reversible, so you have to be quite certain you've finished making all the changes you want to the stocktake. while at the bottom two new buttons are present; Show added adjustments and Show reduced adjustments. Click on either button to display the related inventory adjustment transaction. Note that if you have the Can edit stocktake dates permission (see Managing users) then you will be able to edit the confirmation dates of the inventory adjustments to match the stock take date. For the excel option a spreadsheet will open allowing you to analyse the invoices to which the stock is allocated. The highest invoice number is likely to be the one entered during stocktake. Obviously closing off transactions until stocktake is complete and avoiding these kinds of issues is best practice. Items that weren't changed don't show in the report - if you want to see all items, including those that weren't changed then click on the Print button and select the Inventory adjustments - all item option. 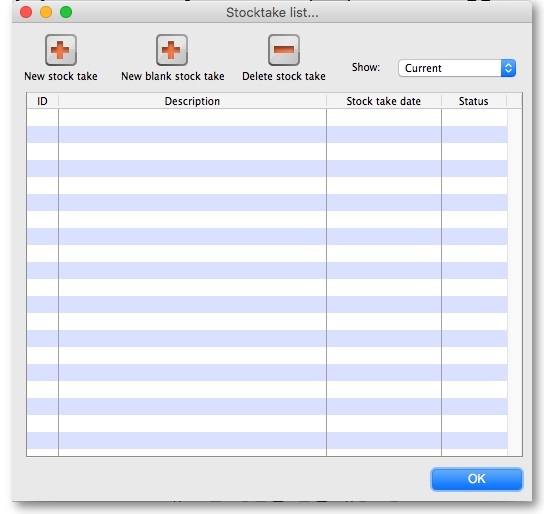 When you have created the stocktake sheet, it's like `taking a snapshot'; the physical stock at that location should not be removed until the stocktake has been performed; nor should stock be added. New transactions can however, be entered into the system. the Log tab on the Stocktake sheet will list any anomalies. An anomaly may occur if a transaction has been entered after the stocktake that issued more stock than you physically counted. Obviously someone has made a mistake in such a situation. There is on the stocktake window (lower left corner) a checkbox Locked , which, if checked, will allow neither deletion of the stocktake nor any changes to be made to it. 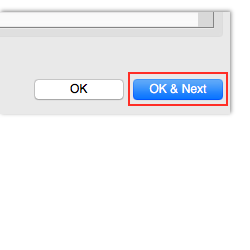 Ok and Next - if you have no more stocktakes to add, click the 'OK' button, to add only the stocktake just completed. To add a further stocktake, click the 'OK & Next' button and proceed to add your next stocktake.